The Fund for Innovation (FFI) application is open for the 2018­-2019 academic year. The fall deadline to apply is October 4, 2018. All faculty, staff, and students are eligible to apply for FFI funding. Grants are open to current students, faculty, and staff across Middlebury. 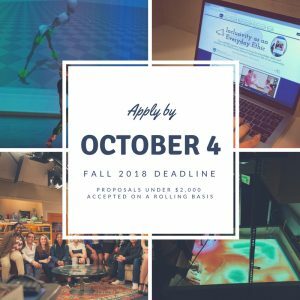 Our next deadline is October 4th, 2018, and we invite all members of the community to submit an application. The FFI also invites applications for Fast-Track grants. These smaller grants are up to $2,000 and are accepted on a rolling basis. The FFI especially encourages students to apply for Fast-Track grants, as the timeline and structure are more supportive of short-term project. The Fund for Innovation was created in March 2015 to honor President Ron Liebowitz and his wife Jessica by fostering continuous innovation at Middlebury. In 2017, President Laurie Patton announced the fund will be used to support projects that will inspire educational innovation. The FFI provides support for experimental and unconventional projects that have the potential to create lasting, positive change and strengthen Middlebury’s educational experience. To date, the FFI has provided funding and support to 29 innovative projects across the College, the Institute, and the Schools. Need some inspiration? Read about our funded projects and learn more about the Fund for Innovation on our webpage. Information about the application process may be found on the FFI website, and questions about specific proposals should be directed to Erin Southworth, Special Projects Assistant in the Office of the Provost. This entry was posted in Midd Blogosphere and tagged For Faculty, For Staff, Midd Points, Midd/MIIS Collaboration on September 21, 2018 by Erin Southworth.